Ben Brown Fine Arts is pleased to present the first UK exhibition of French-Algerian artist Djamel Tatah whose work has been widely exhibited in France and abroad. This exhibition presents twelve mesmerizing oil and wax paintings, monumental in size and typically Untitled, produced in the last year. The subject omnipresent in Tatah’s works is the silent figure – the mirror of all humankind, pain, solitude, melancholy, war and peace. Featured isolated, in pairs or in repetition across large canvases or polyptychs, the silhouettes are consistently depicted in a 1:1 scale. They seldom face the viewer directly, instead they are found gazing upwards, downwards or far into the distance. The works have no title, bringing to the fore issues of identity. Sourcing ideas from a large portfolio of images, from historically significant works of art to press cuttings, films and personal pictures, Tatah composes his scenes, placing family and friends in carefully choreographed poses which he then photographs. The digital image is projected as life size figures onto the canvas, in preparation for a long and meticulous painting process. Wax painting sets the artist’s output apart from others. A method used as early as 1st century AD, in the famous Fayum portraits for example, wax painting had a lasting impression on Tatah and was used from very early on in his artistic experiments. This technique allows the artist to imbue muted colours with deep luminosity. The art of silhouette and repetition are two other major aspects in Tatah’s work. Replicated in series across large canvases, the silhouettes first direct the viewer’s attention to the void, to the immensity of the monochrome background surrounding it, ‘taking them out of all that noise into a world of silence’ as the artist puts it. Yet this void instantly draws the viewer back to the solitary and majestic figure, perfectly cut out in the style of a Byzantine icon. One of Tatah’s large Untitled triptychs in the exhibition highlights the artist’s unique use of white paint to outline his characters, almost carving them out of the canvas. In his second version of Femmes d’Alger (1996) – a seminal work in his oeuvre based on the art historical subject painted by Delacroix and later Picasso – a single figure is reproduced twenty times on the same canvas. 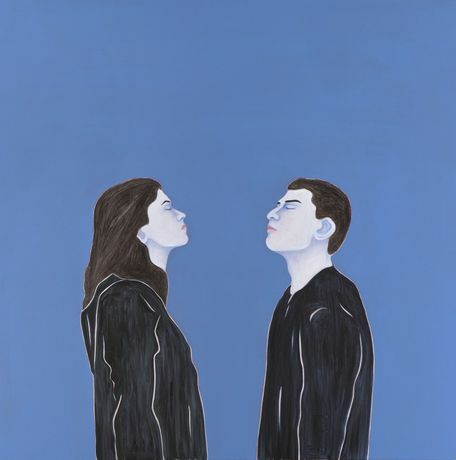 Similarly, his diptych Untitled (2014), showcased in this exhibition, demonstrates how the artist eerily multiplies his characters, placing two either side of a black divide, and suggesting continued cloning beyond the boundaries of the canvas. This experimentation with repetition is the basis for the abstract representation of humanity reflected throughout his work. Tatah’s own pictorial invention is grounded in an ongoing exploration of culture and art from all epochs as varied as Byzantine mosaics and Piero della Francesca to Henri Matisse, Barnett Newman and Francis Bacon. Some of the artist’s most influential discoveries include the Persian and Indian illuminated manuscripts at the British Library in London. The impact of these findings are manifest in the iconographical compositions as well as the use of triptych configurations and grand canvases seen in this exhibition.